Memorial will be a tribute to all who have served in the United States military. (L to R): Legislator Lafazan, Brookville Mayor Dan Serota. Brookville, NY - November 6, 2018 - Nassau County Legislator Joshua Lafazan (Woodbury) marked the 87th anniversary of the Village of Brookville’s incorporation on Saturday, Sept. 22. Legislator Lafazan is pictured with Brookville Mayor Dan Serota and a replica of a memorial that will be erected on Veteran’s Day as a tribute to all who have served in the United States military. For more information, please contact Danny Schrafel at 516-571-4214 or dschrafel@nassaucountyny.gov. 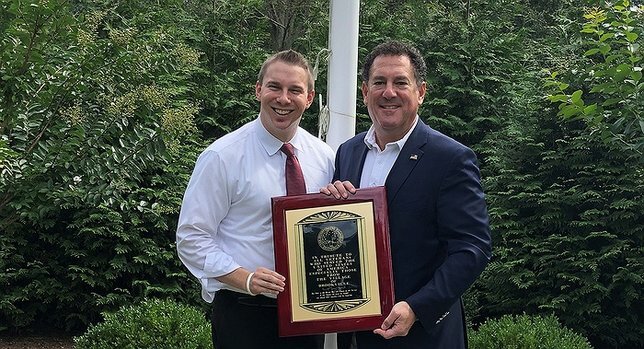 Subject: LongIsland.com - Your Name sent you Article details of "Legislator Joshua Lafazan Previews Veterans Memorial, Marks Incorporated Village of Brookville’s 87th Anniversary"